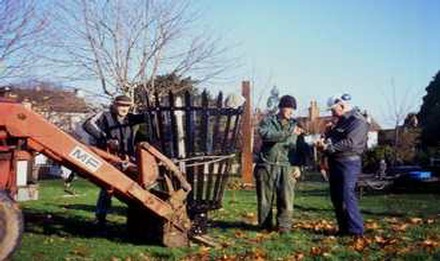 Construction of the Woodborough Millennium Beacon and Rose Garden on the Governors’ Field in the heart of Woodborough was a significant highlight of the Village Millennium celebrations, which culminated in the first lighting of the Beacon on New Years Eve 1999. The idea for a Beacon stems from Woodborough student Miss Georgina Richardson; she made the initial suggestion to the Woodborough Community Association. The Association progressed the project forward under the stewardship of Brian Harris together with Tim Leafe and Ken Brooks. Funding for the project was provided from Gedling Borough Council's Millennium Fund. Designs were made and approved, then detailed construction undertaken by local craftsmen; Roger Doughty who made the column, David Mellows the brazier, and Brian Hopkin the shields. 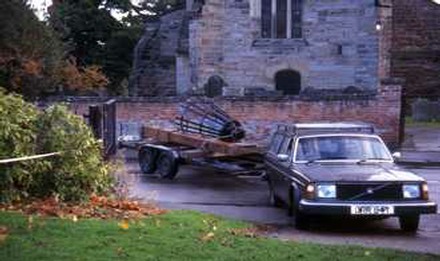 The erection of the Beacon took place over several weekends during November and December 1999.
preparations for installing the post and attaching the brazier. The Woodborough Beacon became part of the Nationwide Chain of Beacons which were given specific times for lighting. After a candle-light procession through the village and a short service of dedication in the nearby Church of St Swithun's. Several hundred local people witnessed the first lighting of our Beacon by Brian Harris in the presence of Cllr. John Glass Mayor of Gedling Borough Council, and members of the Community Association. 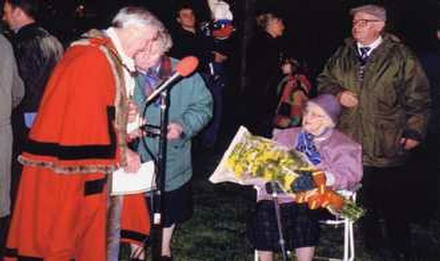 The Woodborough Beacon was lit at 9.45pm on 31st December 1999 at exactly the same time as Her Majesty The Queen lit the London Beacon. 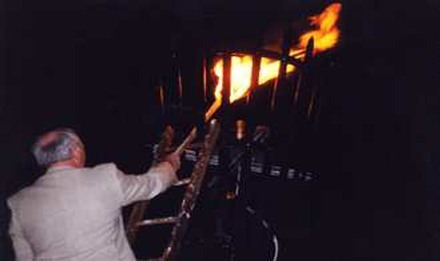 Left: Brian Harris lighting the Beacon for the first time. Right: In attendance, Cllr. John Glass and Nina Litchfield was guest of honour. 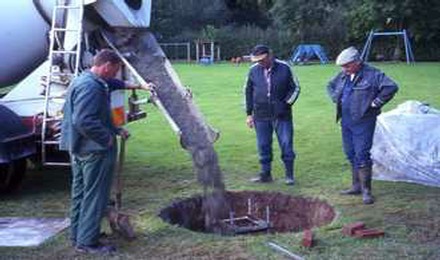 During the construction of the Beacon, allowance was made for the eventual placing of a 50-year time capsule within its base. Children from Woodborough Woods Foundation School selected some of the items for the capsule; other items included details of the Beacon, and the names of the Community Association Committee who had responsibility for it. 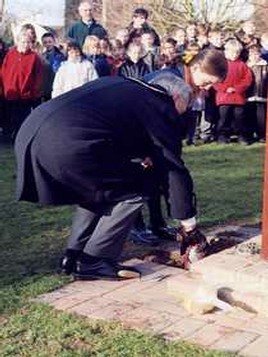 On 16th February 2000 the capsule was placed under the Beacon. 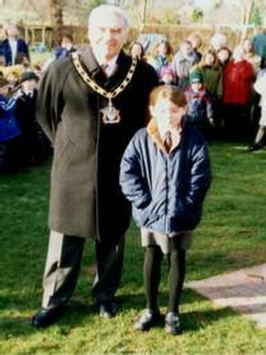 In attendance for the short ceremony were all the children from the Woods School, teaching staff, several local people, the Community Association Committee and The Mayor of Gedling Cllr. John Glass. gathered for the placing of the capsule on 16th February 2000. 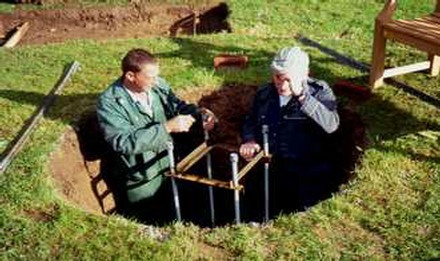 Below: the placing of the capsule. Cllr. 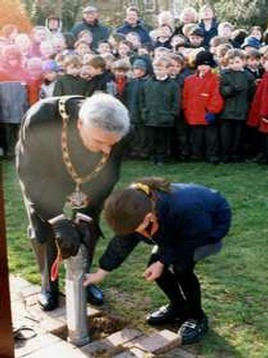 John Glass, Mayor of Gedling and a pupil from Woods Foundation School inserting the capsule. 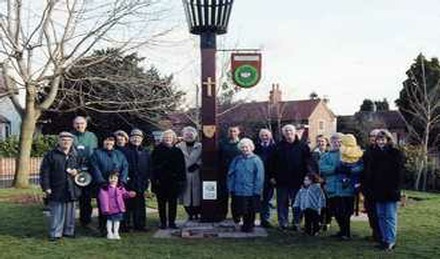 Attached to the Beacon Post are three artefacts carved by local resident Brian Hopkin; "The Cross" the bedrock of Christianity, " The Oak Studs " the symbol of the Trinity; the crucifixion and the three churches of Woodborough, "The Strelley Shield" representing the village's association with the de Strelley family which goes as far back as 1336. Note: The original Strelley Shield has a silver background with six blue stripes and a five-petaled flower with recessed centre. A stonework fragment of the Strelley Shield can be seen on the outside wall above the east window of St Swithun's Church in Woodborough. 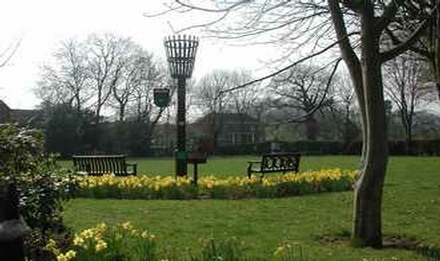 The Beacon is surrounded by a rose garden with two commemorative bench seats that were kindly donated by Mr & Mrs Timmerman of Timmermans Garden Centre, Lowdham Lane, Woodborough. 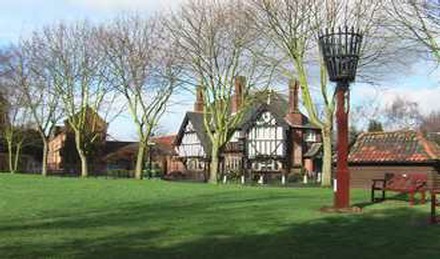 Two views of the Beacon sited in Governors’ Field. The whole project is a worthy one, which complements the style of the village and should be a long lasting memento for future generations to remember the change from one Millennium to another.